Dr. Mackie grew up on a small farm near Fair Hill, Maryland. She started pony club at age eleven and bought her first horse the following year. In 1994, at age sixteen, she started working summers at Winbak Farm in the training barn and at times with the broodmare division. 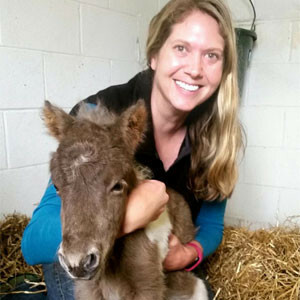 Dr. Mackie graduated from Virginia Tech with a Bachelor’s degree in Animal Science with an equine emphasis in 2000 and then from Virginia-Maryland Regional College of Veterinary Medicine in 2004. Dr. Mackie has worked full time as a resident veterinarian at Winbak upon graduating from vet school. She maintains an interest in equine reproduction, neonatal medicine and herd health. Outside of work, Dr. Mackie enjoys hiking, kayaking, gardening, cooking, taking care of her numerous animals and trail riding with her retired Standardbred mare.